When grandparents are present on a wedding day, I always do my best to photograph them just a little bit more frequently than I photograph other family members. I also try to create situations where the grandparent and his or her grandchild are able to interact naturally, but in very close proximity to each other. 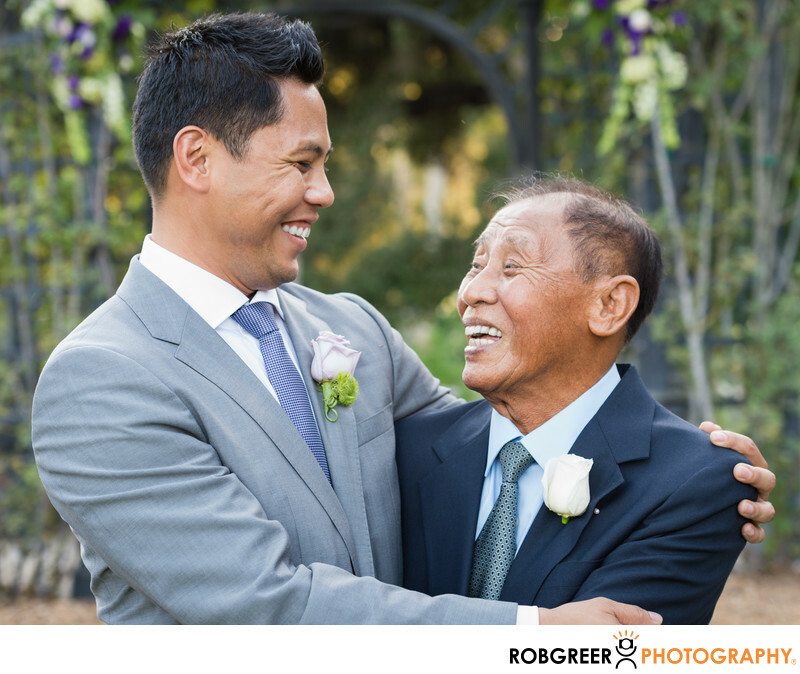 For this particular image, captured during the family portrait time, I first took a traditional portrait of the groom and his grandfather. Then I simply asked them to hug each other a little bit at which time they may have felt a little uncomfortable being so close to each other in public. But then I asked them simply to look at each other. After that, the emotional connection between the two simply took over and they laughed. When looking at images like these I like to think on the import of what they might mean 5, 10, or even 30 years from now. I hope that you'll agree that an image like this for the groom will soon become priceless. And that's what I'm striving to create when I photograph a wedding — priceless memories that are valuable for generations to come. Descanso Gardens is located in La Cañada Flintridge, California. Phone: (818) 949-4291. Website: http://www.descansogardens.org/. Contact Person: Susan Armstrong, (818) 949-4204. Keywords: Descanso Gardens (9). 1/80; f/5.6; ISO 400; 70.0 mm.